A second Muslim elite arose with the decay of Mughal power. 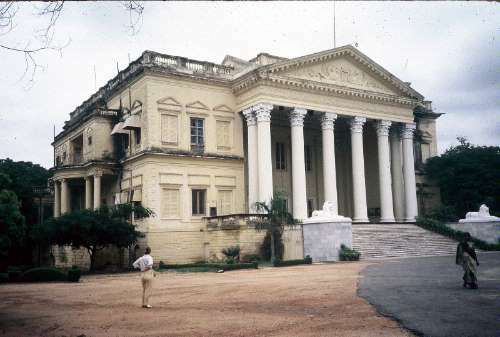 Now Hyderabad belonged to the nizams--the "regulators." 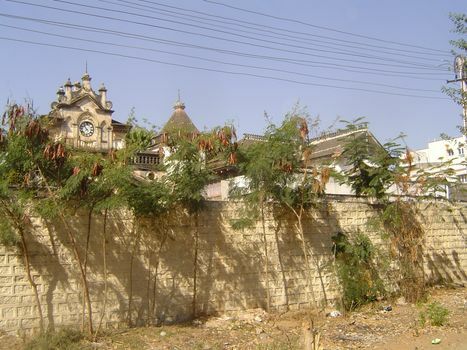 Their power, and that of their nobles, rested on the taxes levied on Hyderabad's peasants. You might say that the elite were tax farmers, because each family was assigned sole rights to a greater or lesser number of villages constituting the family's jagir. Jawaharlal Nehru and the other founders of independent India had no sympathy for these jagirdars They forced the nizam to accede to independent India, and they abolished the jagirs. The elite fell into a poverty from which many never escaped. 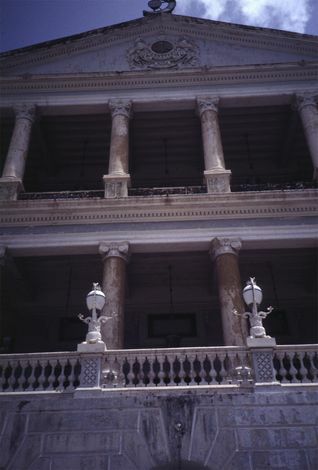 Here, we look at some of the palaces they enjoyed until the music stopped. 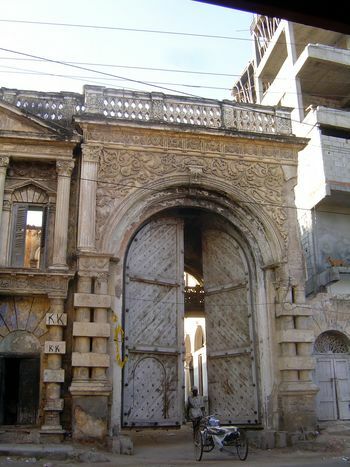 A palace gate, near Char Minar. Good chance this was a jagirdar's place. 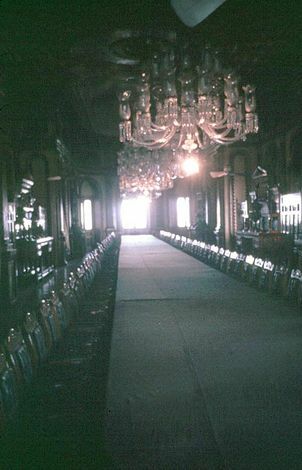 The sixth Nizam, Mahboob, who ruled early in the 20th century, lived comparatively modestly in this place, the Chowmahalla Palace. 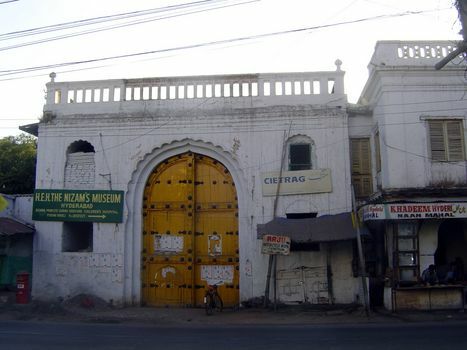 Flanking the palace is this long building, most remarkable for a crank-operated elevator which the nizam used to reach the upper floor. What was there? Yes, indeed: his wardrobe. Laundry was sent to Paris for cleaning. 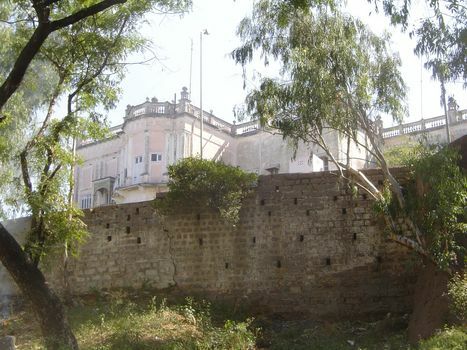 The seventh nizam--and the last to rule--lived across the river in the newer part of the city and in a palace called King Kothi. It's hard to see today. Over a side wall there's a bit of facade. 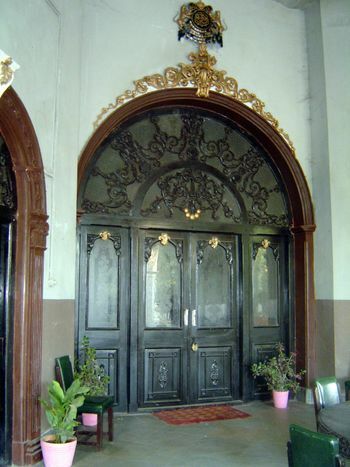 A side entrance, barred tight. Sufficient banging and a reluctant watchman opens the door. Nobody's home. 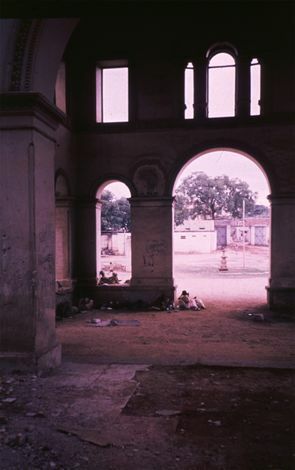 The same place, photographed in 1981, where there wasn't even a watchman. The seventh nizam, Mir Osman Ali Khan, padded around the place in slippers. 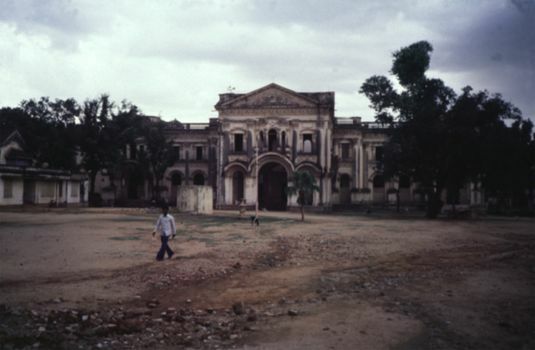 Visiting British viceroys were known to have mistaken him for a disheveled servant. Osman was reputedly the richest man on earth in the 1930s and is said to have had piles of rat-eaten money stashed in corners. There wasn't much left in 1980. 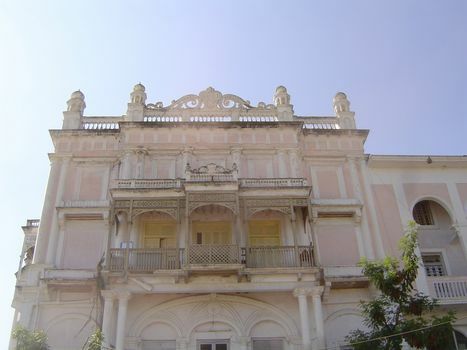 One place, the grandest of all, is still intact: Falaknuma, the "breath of heaven." 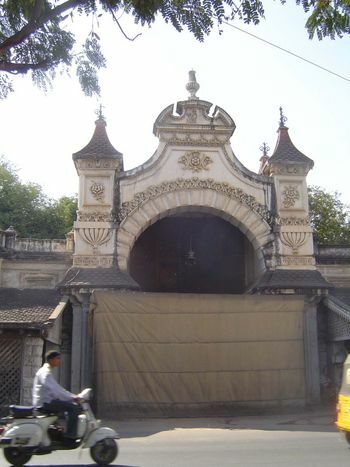 This is the main gate through the surrounding wall. 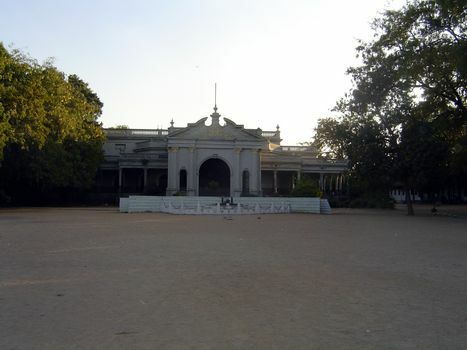 Front view, from the overgrown terrace. 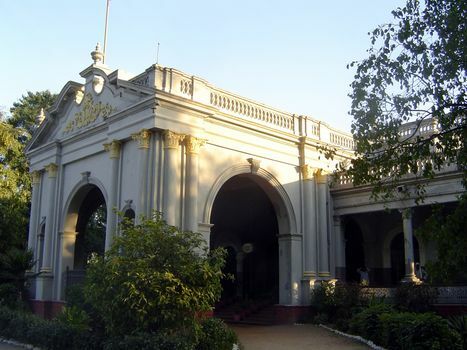 Designed by British architects in 1872, Falaknuma was built as a private home by Sir Vikar-ul-Umra, who served as the sixth nizam's prime minister. 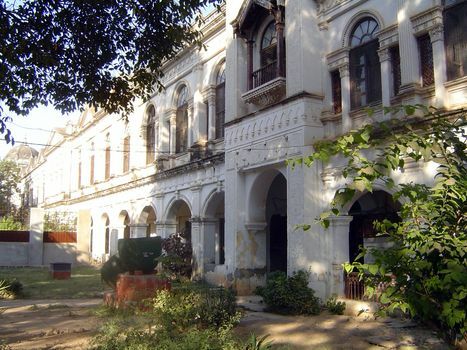 During a visit in 1895, the nizam became enamored of it, whereupon it was his. 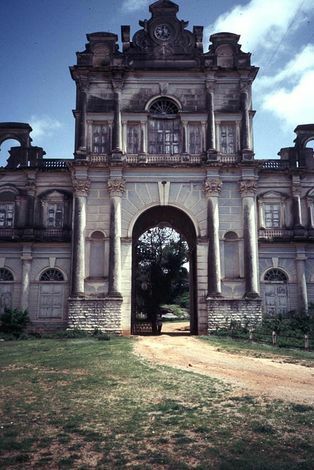 He did later pay for it, but he never had much use for the place, which became a spectacular guest house for visitors, especially India's viceroys. 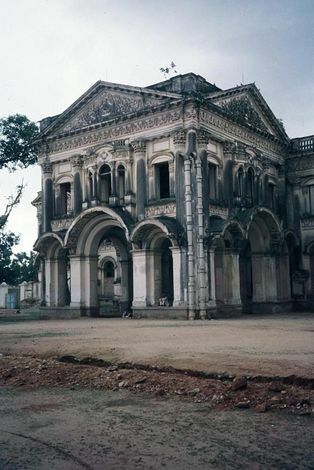 When these pictures were taken in 1981, the palace had been empty for many years, though caretakers lived on the premises. 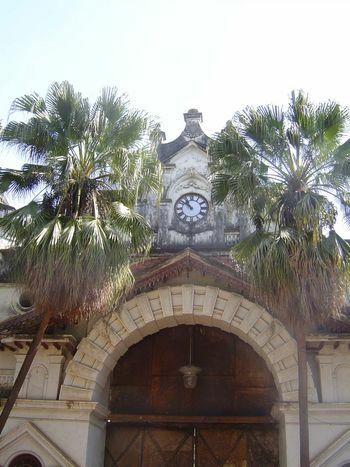 In 2010 the premises opened as a Taj hotel, with very high prices and promotional nonsense about the place having been the cherished residence of a grand line of nizams. Up close: an Islamic crescent crowns the facade. 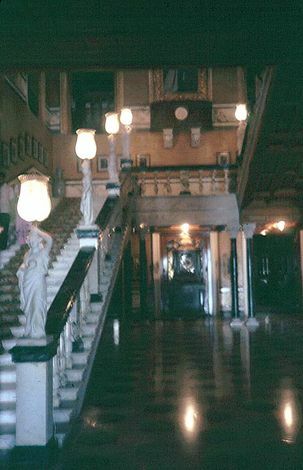 The central block of the palace consists of this great staircase, with surrounding rooms. The portraits lining the staircase are of the viceroys who stayed a night. Electricity was installed for the 1926 visit of the Prince of Wales. The dining room. 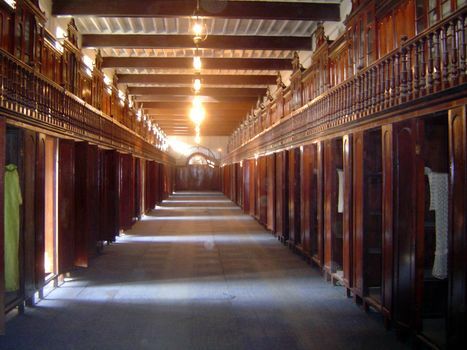 Built-in bookcases in another room were stocked in 1981 with hundreds of copies of Glimpses of the Nizam's Dominions, among the world's most impressive mugbooks. 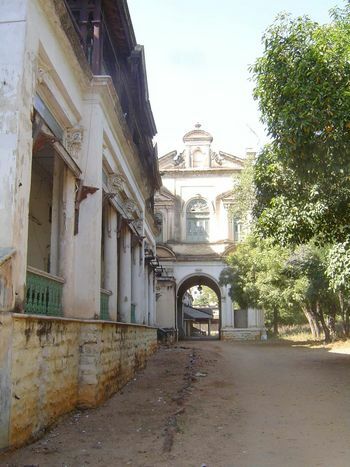 One last palace: Eeram Manzil, the property of one of Hyderabad's grandees. The wealth of the Hyderabad nobility expressed itself in many ways, here in shoes. 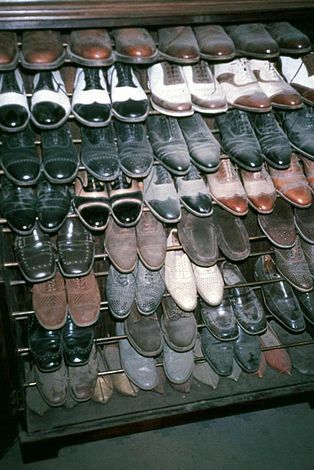 These belonging to a man who had been very wealthy in the 1930s but by the 1980s had been reduced to genteel poverty. He no longer had palaces or cars, but in his small house there were photographs of the past and this collection, long unworn. 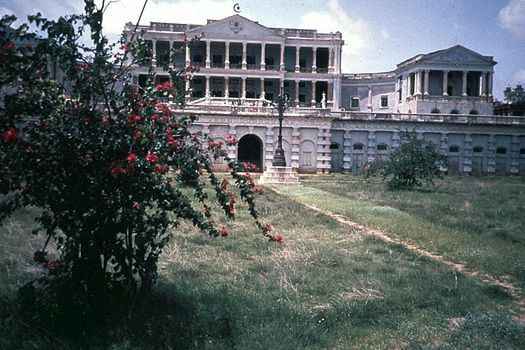 The Hyderabad Residency, built about 1800 to house the unwelcome but inevitable representative of the East India Company. 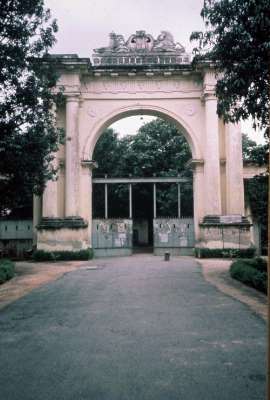 The Residency entrance, now leading to a girl's school.